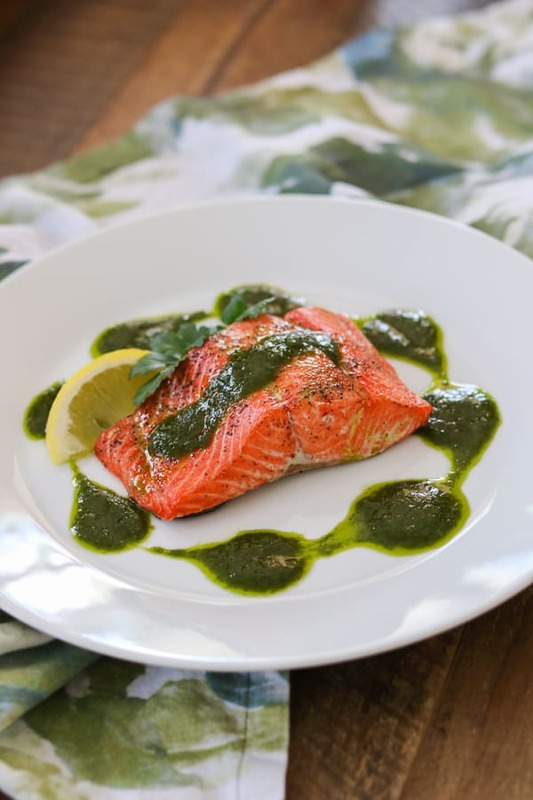 An easy dinner that comes together in less than 15 minutes, this Chimichurri Salmon is healthy and full of flavor. Inspired by my Alaska cruise in May with Princess Cruises, this recipe is one I’ll definitely be making again and again, especially on a busy weeknight! When you hear the word “Alaska” what’s the first thing that comes to mind? I have been sponsored by Princess Cruises to bring you this post, the second in a series sharing our Alaska cruise. As always, all opinions are 100% my own. I don’t know about you, but when I think of Alaska I think of snow, bears, mountains covered in snow, glaciers, lots of pine trees, more snow, and salmon. I know there is SO much more to Alaska than those things I mentioned. Kurt and I went on a few shore excursions while we were on our Alaska cruise with Princess Cruises, so we had a taste of what Alaska has to offer, but the whole experience definitely made me want to go back for more! 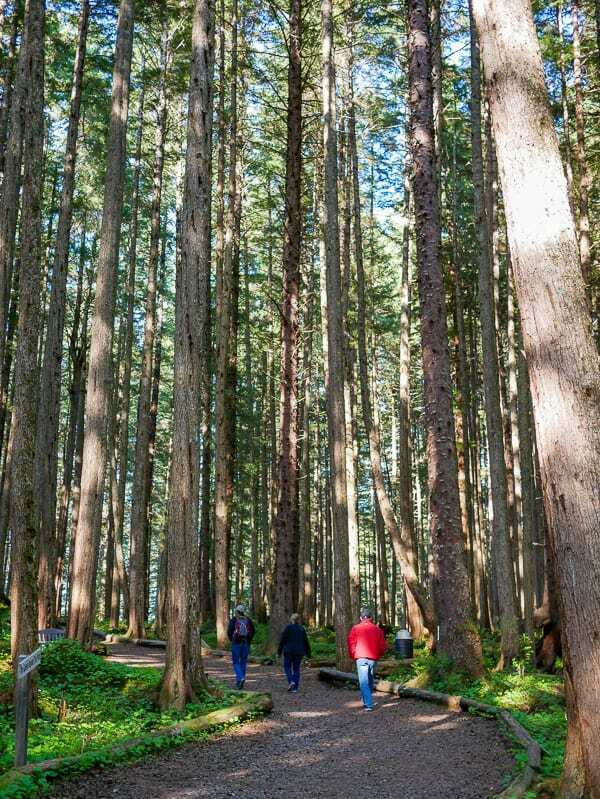 Here Kurt and I, and Erin from Dinners, Dishes and Desserts, and her friend Rachel are walking on a short trail after our excursion at Icy Strait Point. Our time spent here in Icy Strait Point was just one of the many highlights of our One-Way Alaska Cruise. Kurt and I went out in a Zodiac which is an inflatable boat to whale watch and explore the coast. It was breathtaking! Growing up in Rhode Island and spending the majority of our childhoods on boats and the water, hubby and I were in our happy place for sure! Place a rack in the top third of your oven before preheating it. 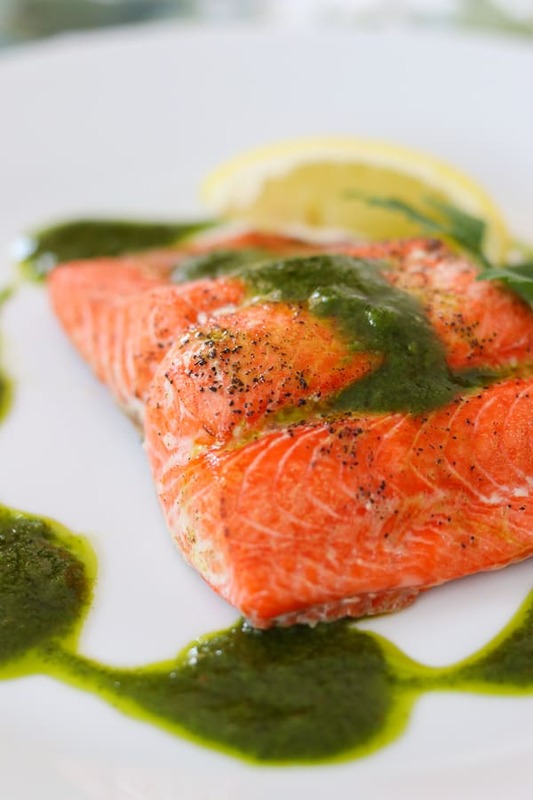 Line a baking sheet with aluminum foil and spray it with a cooking spray to help prevent the salmon from sticking. Remove the leaves from the parsley and cilantro. To do this, hold each bunch of herbs by the stems and using a sharp knife, gently scrape down. This will pull the majority of the leaves off, leaving a small amount in the middle which you pull off by hand. I didn’t want to go to the trouble of pulling my Cuisinart 12-cup food processor out of the cupboard, so I used the NutriBullet. It was perfect because the recipe makes a little less than a full cup, and it was so much easier to clean, too. A blender would be sufficient as well. Just make sure that you scrape down the sides consistently so that the sauce is a smooth puree. I used rice vinegar which gave the sauce a slightly sweeter taste. Chimichurri recipes typically call for red wine vinegar, white wine vinegar, or apple cider vinegar. Each will alter the taste slightly, but not too much. Feel free to experiment and find the best one for your taste! When we were cruising up the coast of Alaska, I was hoping we’d be able to spot some salmon. I’ve always been fascinated by seeing the salmon swim upstream on TV. Unfortunately, we didn’t because it was early in the season which lasts from May until September. I knew it wasn’t going to happen, but I kept wishing cause wishing can make it so, right?! While we were on this trail hike, our guide told us there are three courses to a bear’s diet during the year. When they first come out of hibernation, they like “salad” so they eat a lot of skunk cabbage, dandelion, and other plants. Then over the next few months, they move on to their “main course” which would be the salmon, etc. Finally, they finish it off with “dessert” before returning to hibernation, eating the many berries such as blueberries, huckleberries, and salmonberries found in Alaska. Yes, there is such a thing as a salmonberry and it has nothing to do with the fish. They are similar in look to a raspberry, have lots of seeds, and have a taste between a raspberry and a blackberry. So, while we didn’t see any salmon on our trip, we did enjoy A LOT of fresh delicious seafood both on and off our ship, the Island Princess. 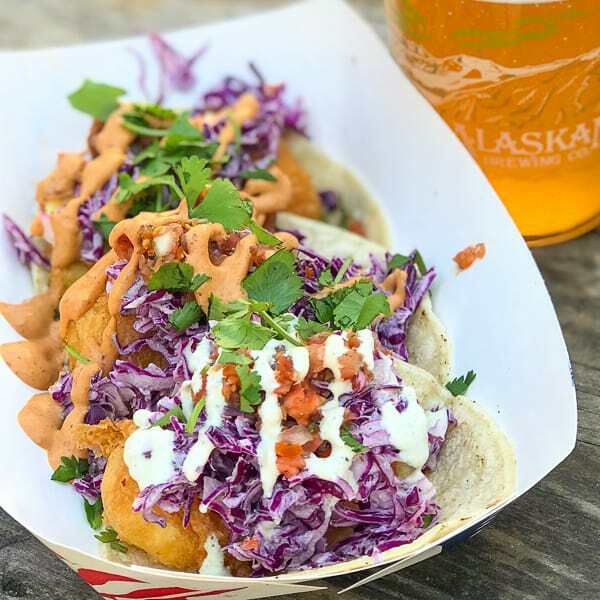 A couple of our favorites were the Alaskan King Crab Legs and the AMAZING Fish Tacos we had in Juneau at Deckhand Dave’s in Juneau. Oh Em GEEEE were they good! I mean, just look at those babies! Trust me, when you go on your Alaska cruise and are looking for excursions and things to do in Juneau, one of the things you MUST do is visit Deckhand Dave’s. You won’t be sorry. 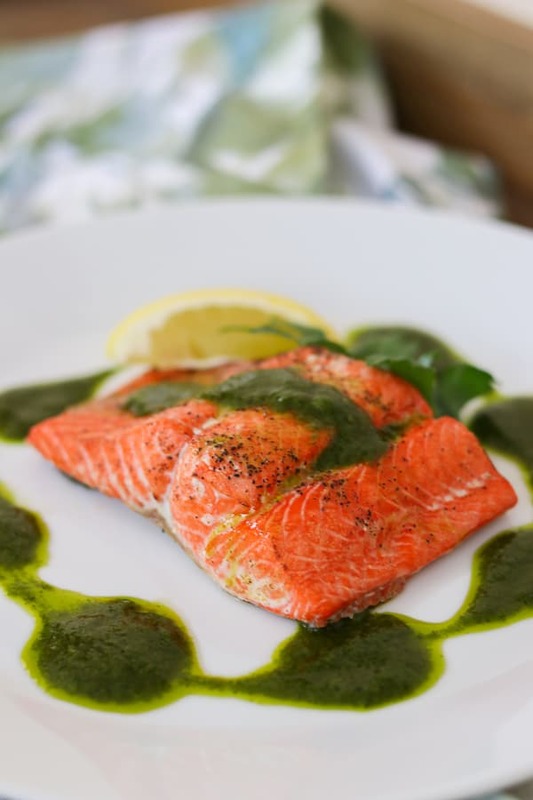 So, when we returned home, I still had salmon on the brain and knew I had to pay tribute to Alaska and Princess Cruises with a recipe incorporating that ingredient. 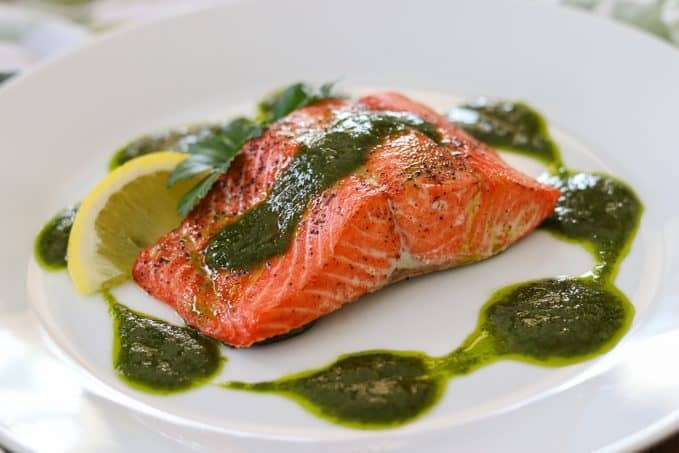 Over the years, I’ve fallen in love with chimichurri and knew it would work well with salmon. This has me excited to use it on some grilled chicken and steak this summer now, too! When it comes to fish, I also love eating it with a fruit salsa, like this Parmesan Crusted Cod and Berry Salsa. Fruit is a great accompaniment and can add so much more flavor, too. This Brown Sugar Honey Salmon with Caramelized Pineapple is a favorite dinner here at the 365 home. Caramelized pineapple is SOOO good (even on dessert)! One of my favorite salsas though is this one with Grilled Peach, Strawberry & Mango. The combination of flavors is seriously amazing. 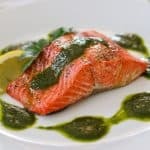 An easy dinner that comes together in less than 15 minutes, this Chimichurri Salmon is healthy and full of flavor. The sauce is made with parsley, cilantro, olive oil, cumin and garlic, and will be great on most meats, too! In a blender, combine the parsley, cilantro, garlic, rice vinegar, cumin, lemon juice, and red pepper flakes and pulse to mix. With blender running on low, slowly add the 1/2 cup olive oil and blend until well combined. Place an oven rack in the top third of the oven and preheat to 425°F. Prepare a rimmed baking sheet by lining it with tin foil and spraying with cooking spray. Place salmon fillets, skin side down, onto the prepared baking sheet. Season with salt and pepper and drizzle with the two teaspoons of olive oil. Bake for 12 -14 minutes or until the fish easily flakes when touched with a fork. Internal temperature should register about 140° F.
Serve topped with chimichurri sauce or with it on the side. So, since I’m loving all things chimichurri, I’ve been searching the interweb for other recipes with it. I came across some that had me drooling, so of course, had to share them with you. This Skirt Steak Marinade with Chimichurri from Grandbaby Cakes is going to be THE perfect recipe for the grill this summer and I cannot wait to make it. When I saw the picture, I just wanted to reach into my monitor and grab a slice! Look at these Shrimp Tacos with Avocado-Chimichurri Sauce from RecipeGirl. Lori had a great idea to incorporate avocado into the sauce, making it a thicker and creamy consistency. The taste must be amazing! Meseidy from The Noshery is a genius. Her Blueberry and Pecan Chicken Salad with Mint Chimichurri is a fantastic option when you are looking for a chicken salad without mayonnaise. I also love the blueberry and mint combination – what a fun and refreshing flavor combination! 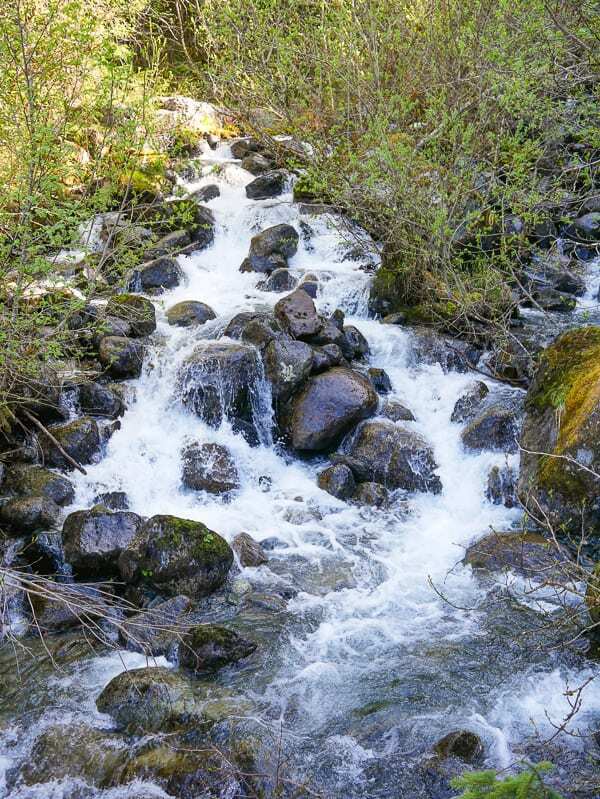 When will YOU be booking your Alaska cruise? It is such an amazing experience that I seriously cannot recommend it enough. It’ll be a great way to escape this summer’s heat, be the perfect vacation without (or even with!) the kids and you’ll see and do things that will leave you with incredible memories! Hurry on last minute Drop and Go deals from Princess Cruise Lines! Oh Lynne that looks positively amazing! Putting it on my list to try! Thanks so much, Amanda! Nothing beats a delicious dinner that’s healthy AND done in a jiffy! Hope you like it!